Make sure your necktie is kept in place by making use of this striking tie bar for men. With laser engraving technology, our design is precisely made. This, along with the natural grain of Cherry wood makes a wood tie bar you can be proud of. Keep your necktie in place and order our wooden tie bar today! HANDMADE IN THE USA- Our engraved tie bar is made right here in the USA to ensure it is of the utmost quality. Each of our products is carefully inspected for quality control. MADE FROM PREMIUM CHERRY WOOD- To make sure our neck tie clip is sturdy and long lasting, we only use premium quality Cherry wood. This type of wood is very durable and can last multiple uses. 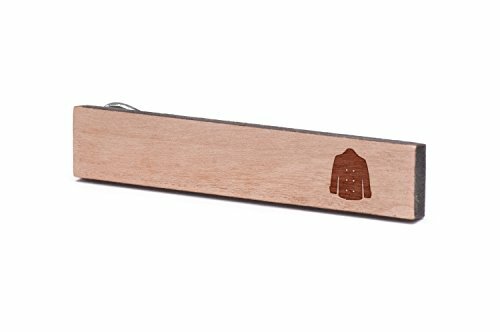 LASER CUT DESIGN- The cherry wood has a beautiful grain design and we've made our wood tie clip look even more beautiful by laser engraving a peacoat design on it. With laser engraving, we can make the design detailed and precise. RUSTIC STYLE AND DESIGN- Use this tie clip to add a rustic design to your outfit. Using this for your wedding is also a great way to add uniformity to what your groomsmen are wearing. SUITABLE GIFT FOR MEN- Gifting this men's tie bar is a great idea because it is a very useful gift. It can be given on different occasions including birthdays, weddings, anniversaries, and any other occasion. If you have any questions about this product by Wooden Accessories Company, contact us by completing and submitting the form below. If you are looking for a specif part number, please include it with your message.